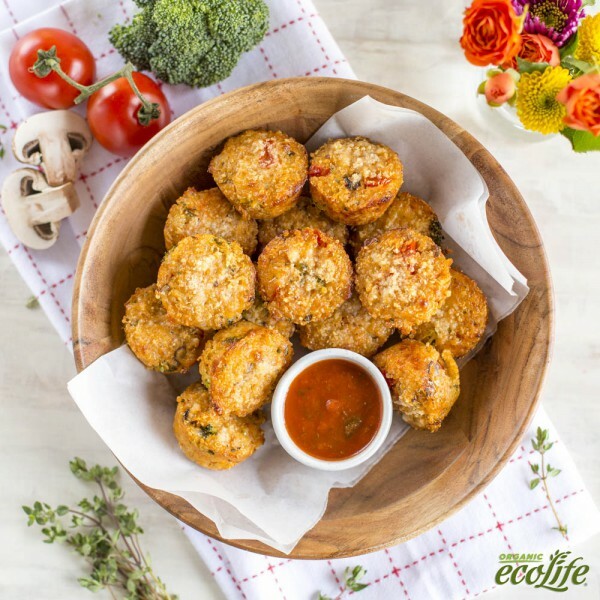 Combine ecoLife® quinoa, water, and salt and bring to a boil in a small sauce pan with a tight fitting lid. Reduce heat to low, cover, and simmer for 15 minutes or until water is absorbed. Spray a mini muffin pan well with non-stick cooking spray and set aside. Add all of the ingredients to a large bowl and mix until fully combined. Add salt and pepper to taste. Evenly distribute the mixture between the pan (you should end up with about 18-20) and gently press it down with the back of a spoon. Bake at 400°F for 15-20 minutes. Remove from the oven and allow to cool in the pan for about 5 minutes. Serve with marinara or pesto sauce.